The DI Dealmaker Suite is Live! With the combination of the top three sources of data and analysis in the DI Dealmaker Suite, we deliver deal information and commentary to your preferred devices in a matter of minutes. It’s this pedigree that positions us as the only provider with a platform that brings together powerful transaction data and analysis, historical data from years of collection, and objective industry data including production, rigs, permits, and leases into a single source for decision making. Within minutes of a new deal announcement that fits within parameters you set, you receive a push notification with the news on your phone via the Drillinginfo mobile app. Opening the deal on the mobile or desktop apps enables you to view the deal terms, the deal report, comps, and other information about publicly reported IP’s, type curves, etc., complete with links to source documents. Create heat maps comprised of layers that show dozens of different parameters for active deals and historical transactions to instantly gain more context into any transaction. If you didn’t attend NAPE, no problem! Head to https://info.drillinginfo.com/dealmaker-suite/ to learn about all the features and schedule a 1:1 demonstration. Despite the precipitous drop in oil prices to close out the year, 2018 set records for U.S. upstream oil & gas M&A activity. The total: $84 billion – the highest since oil prices fell from their peak in late 2014, fueled by a record-setting $32 billion in Q3. That was 76 percent above the quarterly average since 2009. While it’s unlikely 2019 will be another record-setting year, it definitely won’t be quiet. The New Year was just a week old when hedge fund Elliott Management Corp. announced its offer to buy QEP for $2.07 billion. Private and institutional capital is still highly active in the upstream business, and the Elliott-QEP transaction signals that PE capital is ready to move whenever it feels public markets are undervaluing assets or companies. Last month we launched our Executive Deal Summary platform, which produces a concise yet detailed analysis of a significant transaction no more than 48 hours after it’s announced. The Elliott-QEP transaction made headlines on Jan. 7, and two days later the Executive Deal Summary publication was ready. The cover slide provides a detailed transaction summary, and you can see why Elliott finds QEP so attractive. The $8.75/share cash offer price represents a 44 percent premium to QEP’s prior day closing price but is 35 percent below its 52-week high of $13.37/share in July 2018 and below where it was trading in mid-November 2018. Yet QEP shares have been trading at an enterprise value per BOE of proved reserves of $6.77, far below pure Permian producers such as FANG ($23.76/BOE), PE ($18.45/BOE), and PXD ($26.25/BOE). Slide 1 summarizes the agreement terms, asset highlights, and features a map that shows where QEP’s assets are located across the 50,700 net acres in Texas’ Martin, Andrews, and Crockett Counties. Before we continue, I want to call your attention to the bottom right-hand corner of the slide, where you’ll find the Drillinginfo, 1Derrick, and PLS logos. 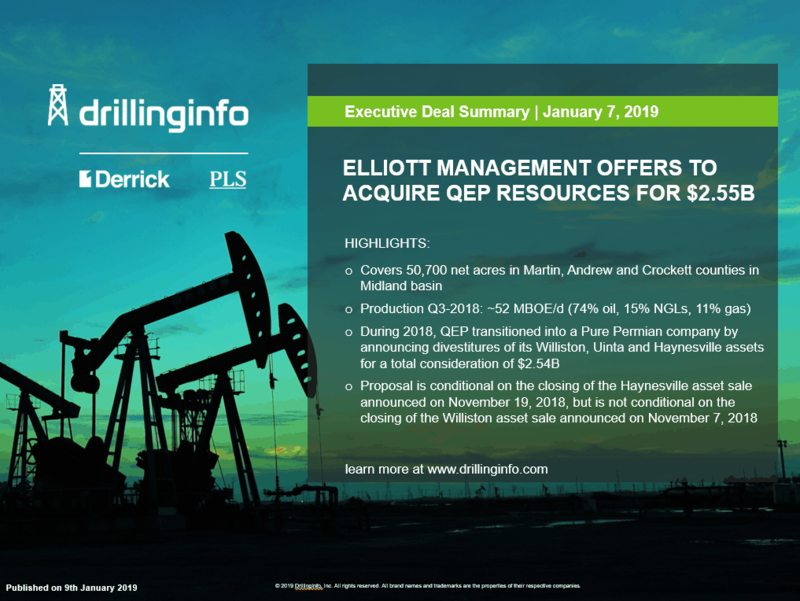 Executive Deal Summary represents the power of the first true integration of Drillinginfo along with PLS and 1Derrick data and analysis since we acquired both companies in 2018. Every Executive Deal Summary publication draws data from the enormous virtual vault of historical data that includes more than 2.5 million source slides in the combined library of all three companies, as well as from current market data. I’ve said it before and it’s worth repeating: no other company can build such an enormous library from scratch or match the speed at which we can deliver an analysis of a significant new deal that incorporates historical data including production, rigs, and leases. Slide 2 shows the historical transactions and assets on the market. Elliott is offering QEP $2.55B or $11,415/acre – well below the past market price for deals in core Midland Basin. Slides 3 and 4 show color-coded maps of Initial Production (30-day Average) and Initial Production (24-hr). Notice that the Initial Production (30-day average) includes direct links to relevant source documents in our database. Additional information is available with quick click hyperlink access to the M&A database on each slide. Slide 5 draws from our Private Equity Database to show private equity-backed operators around this transaction and identifies each PE company along with its commitment and fund year. It includes links directly to the PE database which has detailed information on operators’ strategies, executive team summaries, and primary operational and M&A focus. The map shows all the players – notice this is not Elliott’s first foray into this region. Slide 6 pinpoints all active rigs and recent permits around the Elliott-QEP transaction sorted by operator. Exxon is the most active operator with 10 active rigs and 30 permits in the vicinity of the transacted acreage. QEP, Concho, Endeavor, and Diamondback all have at least four active rigs and 30+ active permits to be drilled. Slides 7-9 break down the type curves and leasing information. We launched Executive Deal Summary less than a month ago, and it’s very exciting and gratifying to see it prepare such a detailed publication so soon after the Elliott-QEP transaction was announced. Executive Deal Summary is unique in its ability to quickly compile such detailed reports that our customers can use to quickly source and analyze the most critical factors of a deal. Executive Deal Summary is available now at no additional cost to all subscribers of the new Drillinginfo M&A database. For more information, click here. Executive Deal Summary will be a key feature of our new Drillinginfo M&A Dealmaker Platform which we will launch this year. As always, you can follow our progress on this blog and engage with me and my team directly by following us on Twitter and Facebook. If you’re a real estate investor evaluating a potential deal, you don’t have a lot of time to spend on research. Other investors are probably eyeing the same opportunity. So, you log in to one app like LoopNet or Zillow which serves as your single source for all relevant information such as recent deals in the area and pricing forecasts. You collect and analyze all the data you need to make a decision before another investor does. Oil & gas industry investors and executives need that same combination of speed, access to historical data, and ease-of-use. After all, deals can be won or lost in a matter of days. But they typically have to spend a week or longer researching, analyzing, and consolidating volumes of raw data from multiple sources. As time ticks by, the risk of a competitor snatching a new investment opportunity out of their hands increases. Our new Executive Deal Summary (EDS) platform eliminates that risk by delivering a concise, yet detailed presentation less than 48 hours after the announcement of a significant investment transaction. The EDS publication provides all relevant information such as total acreage, drilling locations, rig counts, and net production impact. It also places the new transaction in historical context by comparing it to relevant past deals. Its unique capability to quickly compile such detailed reports will make it invaluable to investors and senior executives, not to mention their teams of researchers and analysts. EDS represents the power of the first true integration of Drillinginfo, PLS, and 1Derrick data and analysis since Drillinginfo acquired both companies earlier this year. I’ve met with users of all three platforms, and many had the same feedback: the culmination of their Drillinginfo, PLS, and 1Derrick workflows are very similar. After generating their reports, they spend hours, even days, merging them into one slide deck. Executive Deal Summary takes that workload off their shoulders and speeds the process for sourcing and analyzing the most critical factors that will inform decisions related to their own investments. We have combined the three databases into one enormous virtual vault of historical data that includes more than 2.5 million source slides. EDS draws from it and from current market data, such as production data and rigs and leases to create an easy-to-read publication. No other company can build such an enormous library from scratch or match the speed at which we can now tap into our data stores to deliver an analysis of a significant new deal. Notice that the above slide on the Initial Production (30-day average) includes direct links to source documents in the Drillinginfo database. Clicking on one of those links brings you to the relevant source document, like the one below which shows the comps, type curves, and IP data. The Executive Deal Summary publication also includes hyperlinks directly to the transaction’s source documents and deal sheets in the Drillinginfo M&A database. Every EDS report will be archived so you can revisit them for future research projects. You do not have to take the time to build a new workspace from scratch in the Drillinginfo web application and import EDS components each time a new deal occurs. EDS will automatically populate pre-built workspaces based on your content preferences. This means that you can immediately start diving further down into details on a dynamic platform that is always current, even if the deal occurred months ago. Executive Deal Summary is available now at no additional cost to all subscribers of Drillinginfo’s new M&A database. For more information, click here. We’ll be adding new features and functionalities to EDS in the coming weeks and months. It will also be a key feature of our new Drillinginfo M&A Dealmaker Platform which is on schedule to launch early next year. You can follow our progress on this blog and by following us on Twitter and Facebook. In my previous post, I described our ongoing work to build the Oil & Gas industry’s first M&A deal evaluation platform that will incorporate the databases and technologies of the three most trusted sources for information and analysis: Drillinginfo, PLS and 1Derrick. We’re building a “single pane of glass” that will revolutionize how you research and evaluate potential and completed deals, no matter what area of our industry you represent. Drillinginfo has built its reputation as the industry-leading provider of data and analysis for decision-making in the oil & gas space. Our acquisitions of PLS and 1Derrick enable us to deliver a new depth of insight, specific to the transactions that happen in the industry and delivered to a much broader audience, including C-level executives, M&A professionals and others who want more context around transactions. We’ll be able to deliver the most relevant information related to deals in a matter of minutes on all their preferred devices. Let’s use a recent real-world example to show how our new platform will put actionable intelligence right at your fingertips at any time, wherever you are. You receive a push notification with the news on your phone via the Drillinginfo mobile app because you have set up a Drillinginfo “Virtual Scout” that constantly monitors for news related to parameters you pre-defined including buyers, sellers and custom areas of focus. You’ll receive notifications whenever buyers and sellers you specify complete a transaction or post a deal for sale offset from your core acreage positions. You open the app and tap on the deal to view the deal terms, the deal report and other related information, analysis and commentary compiled from the unmatched combination of the Drillinginfo, PLS and 1Derrick analysts and platforms. This includes comps and other information about publicly reported IP’s, type curves, etc., complete with links back to source documents. Within seconds, you can map the deal within the app to see acreage position and add layers of active rigs, permits and deals for sale to instantly get more context into the transaction. Go back to the Activity Detail screen and tap on the “Alert Team” button to save the deal to a workspace in your Drillinginfo dashboard and send an alert to your team. Your lead analysts jump into research mode by quickly accessing that same workspace in the Drillinginfo web or mobile app, which by now has the acreage position and other relevant context such as offset production and transactions, permits, rigs, leases and type curves. If you’re familiar with our web app, you’ll notice one very important new addition: M&A Data Sets. This is where you can filter all the transactions you’re following by a number of factors including location, date, deal types and value and acreage. Let’s say one of your analysts wants to see the impact the Diamondback-Energen deal will have in Reeves (Tex.) county. Setting that parameter returns a detailed map of all transactions in the county which you can color-code deals by values, price per acreage or a wide range of other factors to see how that deal stacks up. Clicking on the Diamondback-Energen headline brings up the Transactions Card so the analyst can see all the details of the deal including direct links to relevant source documents. Within an hour after your received that first mobile alert, you and your team have volumes of information at your disposal that would have normally taken days, even weeks, to compile. We’re on schedule to launch our new dealmaker platform early next year. But we’re not going to wait until the calendar flips to 2019 to start rolling out some of the platform’s innovative features and capabilities. Next month, we will launch a new product for O&G industry executives, investors, analysts and anyone else who wants to be able to quickly and easily evaluate deals that will demonstrate the power of combining data from the Drillinginfo, PLS and 1Derrick databases. That’s all I can divulge for now, so stay tuned to this blog and be on the lookout for my next post… You can also stay up-to-date by following us on Twitter and Facebook. Get ready to get smarter – faster – on what’s happening in O&G M&A. We live in an age where information is available in real-time at our fingertips, from breaking news to changing stock prices and sports scores. The same should be true for O&G company executives, investors, analysts and other industry players following pending or completed deals. Yet too often conducting the most basic research requires spending days searching multiple sources and reading SEC filings, financials, market analyses and other data. Drillinginfo is changing that. Information is power. “First mover” access to information — beating competitors to the data – can be the difference in succeeding or missing out in today’s hyper competitive environment. I thought of that while reading a recent article by Mergers & Acquisitions Editor-in-Chief Mary Kathleen Flynn on how private equity firms are just beginning to use big data to evaluate potential investment targets. I saw a lot of similarities to our industry. The data you need to evaluate deals is available, but collecting it typically requires you (or your research interns) to spend days, even weeks, searching through multiple sources. We’re going to eliminate that virtual legwork by doing it for you. With our acquisitions of PLS and 1Derrick we are creating the industry’s first M&A deal evaluation platform. We’re integrating the people, technologies and databases of two industry leaders to create a game-changing solution for more quickly identifying and value transaction opportunities. Our dealmaker platform will collect data from all those disparate sources and funnel it right to your fingertips – literally. Just a couple clicks of your mouse or taps on your smartphone or tablet, and you’ll have all the data you need to make better informed decisions. As this infographic illustrates, our new M&A dealmaker platform delivers that power to banks, E&P firms, buy side firms and CLO managers, Oilfield Services and Midstream companies and mineral rights/buyers family offices. I will be sure to post regular updates on our progress developing this incredibly powerful tool to this blog, and you can also stay up-to-date by following my updates to this blog, and us on Twitter and LinkedIn. When we launch the Drillinginfo M&A dealmaker platform, you’ll spend less time reading and more time making deals happen.